Hello there old sun - you look different today.! In fact he looks different every day -every hour. He looks very red - but that is just the way NASA takes the photos that gives him a very ruddy complexion. Why am I writing about the sun? Well the Space Weathermen are telling us that the sun is waking up at the moment and when it does it can let off a few mighty farts. The next year or so we might have to deal with a lot of sun flares or CMEs. Do you see the bright bit at the top right of the photo? That is called a CME (Coronal Mass Ejection). Think of it this way - it is the sun taking a fart. Thing is, when the sun farts, it ejects vast amounts of energy. The energy is in the form of Electro Magnetic energy - X-Rays etc. 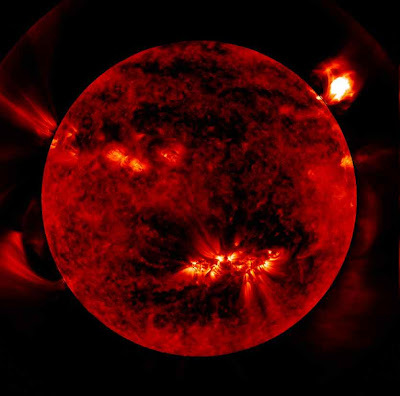 When that lot hits the Earth, among other things it produces the Aurora or Northern Lights, if the CME is really strong, it can also cause major damage to electrical power grids, and wipe out communications. If the sun has some really big CMEs we could easily see major wipe-outs of our electrical grids world wide. Sure they can be repaired - but in some cases it could take weeks or even months depending on the level of damage. If enough damage is done on a very wide scale, the spare parts, transformers etc. could run out, and leave places without power for many months. Now, if you have a home with its cooking, heating system etc. dependent on electricity, you are in big trouble. Geo -thermal heating systems are off-line, oil-fired boilers are off-line, all and any complex heating or cooking system is off-line. What will remain unaffected are the good old fashioned stoves and solid fuel cookers. if you have enough fuel to hand, you can go for months at a time. It is just another very good reason to have a stove fitted and build up a good fuel supply.